The Den in Wardour Street, Soho, has invited Cyprus's Lost + Found, one of the world's best bars, to pop-up for 4 days. Expect Lost + Found's signature cocktails, including Three of Strong (featuring Sailor Jerry, Aperol with passion fruit, lemon juice and angostura bitters), and Pot of Gold (with Bacardi Carta Blanca, El Dorado 5 years, Wray & Nephew, Chartreuse, Rhum Agricole, Caol ila 12, Bacardi 8 years, and lots more.) A taste of summer! 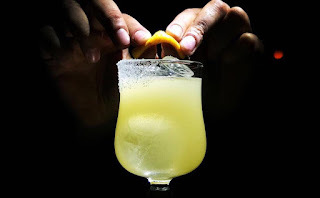 "Lost + Found, renowned for its quirkiness and killer cocktails, will set up shop at The Den from 4th to 7th June in celebration of the Soho bar’s elegant makeover and new cocktail concept launching in June. For the first time ever, the Cyprus-based drinkery will bring their coveted cocktails exclusively to a London venue. Founder Dinos Constantinides and his team will be showcasing their expert skills and inimitable concoctions, which deservedly won 29th place in the 2017 World’s 50 best bars list, offering Londoners the chance to sample Lost + Found’s renowned and innovative cocktail menu first-hand. The Den, nestled in the heart of Soho, will be fully revamped in time for the takeover. The intimate and cosy space will feature a new refined look, with dark hues and eccentric touches providing the perfect stage to host some of the world’s most cutting-edge cocktails. The Den will also launch a brand new cocktail concept in June with a new literary-inspired menu divided into four categories - fairytales, historic books, all time novels and myths & legends."